Some light internet browsing led me to the process of phytoremediation. Phytoremediation is the direct use of living green plants for the removal, degradation, or containment of contaminants in soils, sludges, sediments, surface water and groundwater. Basically it is a solar powered, natural clean up process. 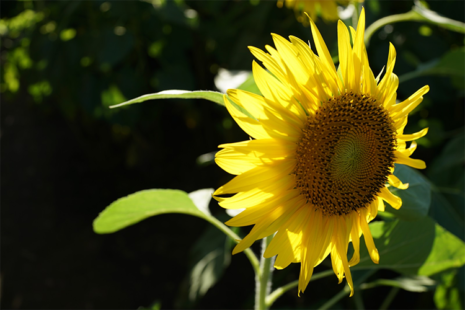 Sunflowers (Helianthus annuus) are famous phytoremediators. Sunflowers are not only able to absorb lead, but other dangerous heavy metals such as arsenic, zinc, chromium, copper, and manganese. Additionally, sunflowers are basically native to New York. There are records of the species in the state dating back 5,000 years. I decided to test if sunflowers would improve the quality of the soil here at Stuyvesant Cove Park. I have cleared out two 3 meter by 8 meter plots in Beds 12 and 14, the beds with the highest levels of lead. In the coming weeks, I am going to plant a quarter pound of sunflower seeds in trays, then transplant them to the empty plots. In the autumn, when the growing season of the sunflowers is over, the staff of Solar 1 will pull out all of the sunflowers and dispose of them in a landfill so the contaminants the sunflowers have extracted aren’t returned to the soil. Then, the staff will do follow up soil tests in the two plots to see if the lead levels are greater than or less than prior to the sunflowers being planted. PS If you have visited the Park lately, you may have noticed some common sunflowers blooming in one of our beds (although the current drought has wilted them some). Those are not Hannah’s sunflowers; those are rogues. We have a few every year!